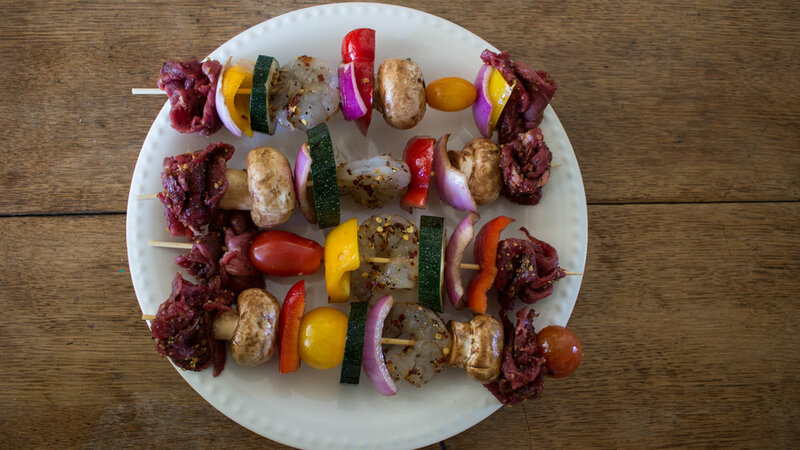 Surf & Turf Kabobs w/ Corn on the Cob — Happy Food Co.
LIGHT the grill or pre-heat the oven to 450 degrees. MIX the beef with HFCo steak seasoning. TOSS the shrimp mix in HFCo shrimp seasoning. COMBINE the veggies (button mushrooms, bell pepper slices, red onion slices, zucchini rounds, cherry tomatoes) in a large bowl and coat with balsamic vinegar and extra virgin olive oil. SKEWER the beef, jumbo shrimp and veggies. ★TIP #1: You can skewer the protein and veggies separately to accommodate a vegetarian diet. ★TIP #2: Extra skewers are included so you can use any combination of ingredients! GRILL (CHEF RECOMMENDED): Arrange the kabobs in rows on the grill. Place the corn on the grill over indirect heat. Grill for about 5 minutes, turning once. Remove kabobs and turn corn. Cook corn for 5 more minutes. OVEN: Place the kabobs and corn on a foil-lined baking pan, and bake at 450 degrees for 5 minutes. ★TIP: Check carefully to ensure that you do not over-cook the beef. MELT the butter over the corn and sprinkle with tajin seasoning. SERVE the kabobs and corn with the HFCo barbecue sauce and an ice-cold brew. Enjoy!